Loss of posterior teeth (molars and premolars) may result in excessive forces being placed on your remaining teeth. Fortunately, the use of dental implants and crowns allow you to replace these missing teeth. However, the position of the sinus in the upper posterior areas may be too low for proper placement of dental implants. A procedure allows the sinus floor to be repositioned, creating enough space to properly place an implant. Various grafting materials are used to encourage your bone to grow more quickly into the area, helping to stabilize the dental implant. 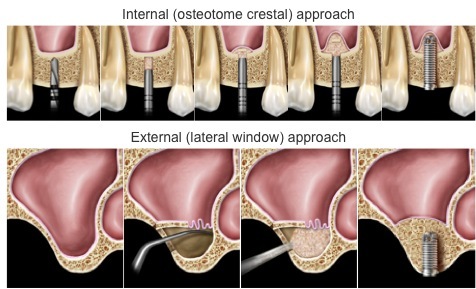 Under certain conditions, another procedure called "osteotome" technique can be utilized . When possible, the bone remaining under the sinus floor is gently “pushed up”, thus lifting the floor of the “dropped” sinus. Bone replacement materials are then placed beneath this lifted bone. Once again the bone materials are replaced as your body grow new bone into this area. Sinus augmentation procedures are predictable, with studies reporting over 95% success. Following sufficient healing of a sinus augmentation (6-9 months), implants are placed in a predictable and successful manner. It is important to realize that if the sinus augmentation procedure does not result in enough bone for implant placement, additional bone may be regenerated through a second sinus augmentation procedure at the time of implant placement.